It’s 5 Star Makeover time again and our theme this month is an English tea party and all that goes with it. When I heard tea party, my thoughts went immediately to my platonic ideal of tea parties at Claridges in London and my first elegant English tea. I’ve been to wonderful tea parties since but that one remains the standard against which all others are measured. Oh yes, I did have a few small flirtations with tea parties before Claridges –– first as a child purloining a precious miniature golden set in my gram’s china cabinet for my make-believe tea parties and then as a teen with herbal teas in rough artisanal mugs that went with patchouli oil, waist length hair and folk music, but that was an aberration. The idea of taking tea was firmly imprinted on my brain as an occasion perfumed with vases of blowsy roses, propped with elegant china, lots of silver, tiered sweet stands and snowy napery ­–– nearly blinding in its crisp whiteness. That was what I found manifestly at Claridges in Mayfair. History and elegance is the blood and breath and pulse of the place as is the sublime service. 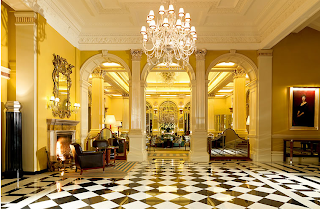 I got to stay at the storied Claridges when I was just at the end of college and a lovely friend swept me away to London after I told him I loved the city –– 2 weeks later I was there –– and what a there! It was the perfect place to experience my first great tea. 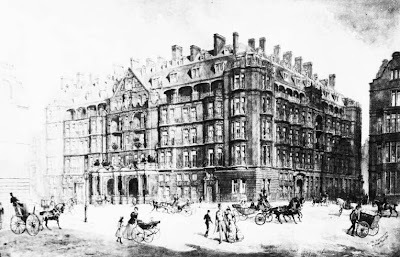 Claridges began in 1812 as Mivarts Hotel. It was combined in 1854 with a hotel belonging to Mr and Mrs Claridge and soon became THE hotel in London when the Empress Eugenie stayed there and Queen Victoria came to call in 1860. It was so successful that it was purchased by the owner of the Savoy Hotel and impresario of Gilbert and Sullivan fame –– Richard D’Oyly Carte. He tore down the old space and created a state-of-the-art hotel in 1898 with individual bathrooms and elevators. It was successful as well. 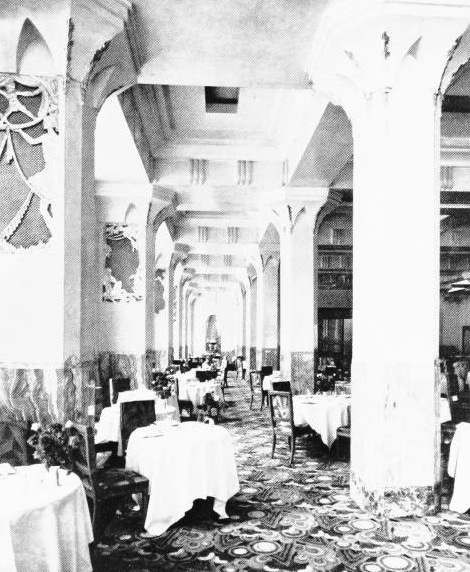 The 1920’s saw a new Deco spirit in London and Basil Ionides was brought in to re-design the restaurant and bring it into the modern age. Ionides was a great choice (he's known for his striking work on the Deco masterpiece, the Savoy Theatre). 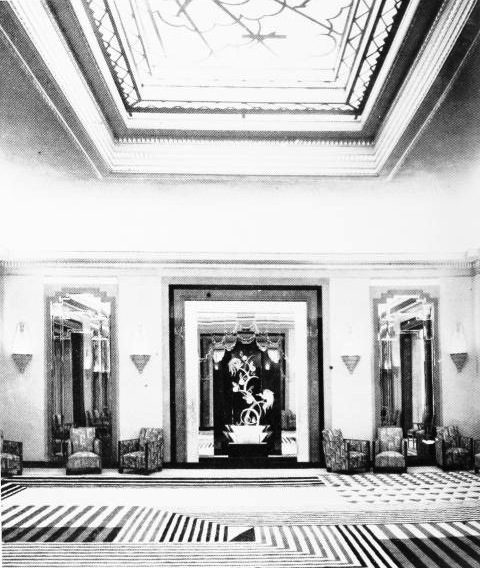 In 1929, Sir Edwin Lutyen’s former assistant, Oswald Milne, designed a new main entrance and removed the old-fashioned carriage drive in the front of the hotel. The 30’s saw a new Deco addition to the east of the old Victorian Claridges building (there are great images of the 1930s Claridges on the Royal Institute of British Architects site). Since then, Thierry Despont did a 1996 renovation on the venerable hotel that sort of pales in comparison to the earlier versions in my humble opinion (as the following photos show–– you can decide for yourself). Many celebrities have stayed there from Cary Grant to Brad and Angelina as well as visiting royalty and aristocrats from all over the world. There is a story that someone called up asking for The King and the polite fellow answered, “Which one?” It has been called an extension to Buckingham Palace because of its long connection with the royal family. Although they would go to the ends of the earth for a client (they made a room a piece of Yugoslavia for a day so a prince could claim he was born in Yugoslavia), they were sticklers for appearances and made Kate Hepburn come in the service entrance when she was wearing trousers. Lovely people of all sorts still meet at Claridges and for $50 to $100 they can luxuriate in the ceremony of taking tea for an afternoon and feel the world revolve just a little more slowly for them for a few hours. I had such a clear memory of the serene service of the place, the small sandwiches and cakes, scones and glacéed fruit with jam pots, cream pots and tea, lovely fragrant tea (and a bit of champagne if I remember correctly). 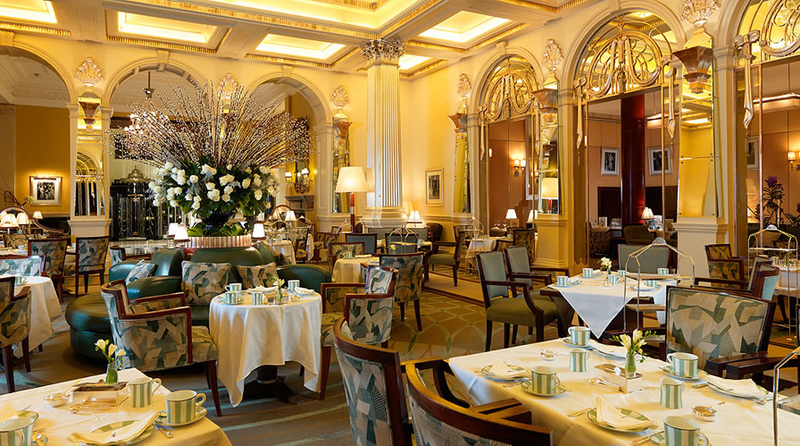 It is still great, and won The Tea Guild’s 2011 Top London Afternoon Tea award. I used to be terribly fond of creamy desserts and I remember one that I found particularly addicting –– a Fraisier. There was something about the soaked cake, fluffy cream and strawberries with the remarkable red gelée that was perfection –– waves of flavor and texture. Perfect for a tea, or anything else for that matter. This recipe makes a good deal of cake and I must say that I usually think of Fraisiers made with a flat sheet cake in very thin layers. The fluffy chiffon cake was tough to cut in thin layers, but I found the lightness of the cake quite lovely and an improvement on the more stolid sheet cake. Many versions of the dessert are made with 2 layers of cake on top and bottom –– I liked one layer better. Some versions also have a layer of almond paste instead of the gelée. 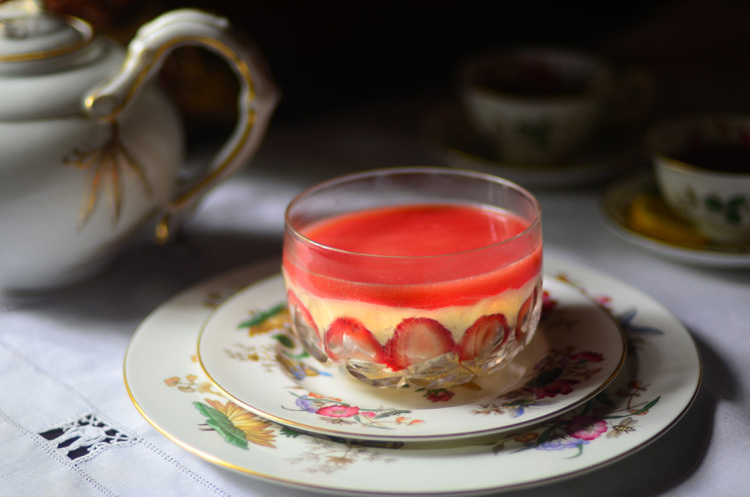 I love the gelée and the tart contrast it offers and adding a little bit of Aftelier rose essence to the mixture makes it really superb. Also, the cream layer is really fine. Terribly light and airy so that it sort of evanesces in your mouth as you eat it (and the rose geranium is another great addition to an already great recipe). All and all, it was great and really refreshed my memories of that first great tea so many years ago. Although it takes a bit of time it's less complicated than it looks. You could make it in a snap if you bought your cake. Put the egg whites into a stand mixer, and beat on medium speed using a whisk attachment on a medium speed, until frothy. Add cream of tartar and beat on a medium speed until the whites hold soft peaks. Slowly add the remaining sugar and beat on a medium-high speed until the whites hold firm and form shiny peaks. Pour the mixture back into the warm pot and continue to cook over a medium heat until the custard is thick, just about to boil and coats the back of a spoon. Take the leaves out at this point. Cut the butter into four pieces and whisk into the pastry cream a piece at a time until smooth if you are using the butter. If you want a stronger rose geranium flavor, put the leaves back in the cream. Cover the cream with plastic wrap, pressing the plastic wrap onto the top of the cream to prevent a skin from forming. Chill in the refrigerator for up to five days. Remove the leaves when you are ready to move on to the next step. Measure 1/4 cup (2 oz/60 ml) of the chilled pastry cream into a small stainless steel bowl that will sit across the saucepan with the simmering water, without touching the water. OR moisten the cake with a good madeira or sherry-spiked sugar syrup like a trifle I’d say 2 T should do it. Puree the berries with sugar, ½ c water and salt. Strain through a fine strainer (you should have 2 c). Sprinkle gelatin over water and soften for 5 minutes. Heat the strawberry puree over medium heat. Add the gelatin to ½ c puree and combine, then combine with the rest of the strawberries and the rose. Let it cool somewhat before pouring on the cream.
. Line the sides of a 8-inch (20 cm) spring form pan or 6-8 single molds with plastic wrap. Do not line the bottom of the pan/molds.
. Cut the cake horizontally to form thin layers. I made mine quite thin but you can chose the best for your taste.
. Fit the bottom layer into the prepared spring form pan or molds. Moisten the layer evenly with the simple syrup. When the cake has absorbed enough syrup to resemble a squishy sponge, you have enough.
. Hull and slice in half enough strawberries to arrange around the sides of the cake pan. Place the cut side of the strawberry against the sides of whatever pan you use, point side up forming a ring.
. Pipe cream in-between strawberries and a thin layer across the top of the cake (I also used the end of a spoon to make sure the cream had gone between the berries).
. Hull and quarter your remaining strawberries and place them in the middle of the cake. Cover the strawberries and entirely with the pastry cream.
. Pour the just cooled gelée on top in an even layer and refrigerate for at least 4 hours.
. To serve, release the sides of the spring form pan and peel away the plastic wrap or pull off your rings and peel away the plastic or just serve if you are putting it in a glass bowl. Most of the information about Claridges came from their website. Come visit the five star makeover on Friday to see all the great tea parties from my amazing compatriots! 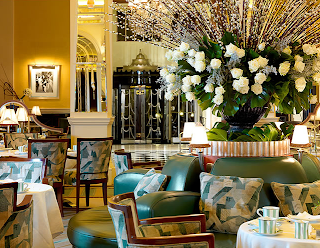 Claridges is indeed a very English Institution, as is the taking of Afternoon Tea. Regrettably we find that more people these days refer to 'tea' when they really mean 'dinner' except that it is served at the ridiculous hours of 5pm or 6pm when afternoon Tea should have been taken at 4pm. Thankfully, standards are still very much alive at Claridges, even though we do prefer the 1930s interiors. And, still on the subject of tea, why is it that some people will insist on putting the milk in the cup first or, horror of horrors, never serve additional hot water?!!! It sounds heavenly but way out of my level of expertise! I don't have much of a sweet tooth but I love LOVE strawberry shortcake. 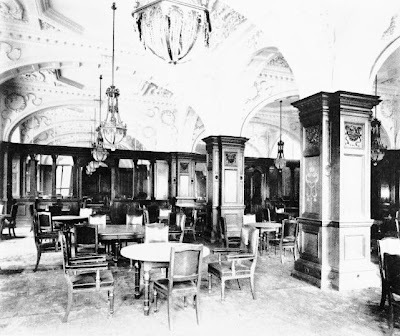 The dining room pales compared to the older versions, don't you think? I can't believe I have something bad to say about Thierry Despont -it's just so....ordinary looking. The tea time at Claridges sound absolutely fabulous and your fraisiers are so gorgeous, beautiful color! Awesome post. I love Claridges. Great read. 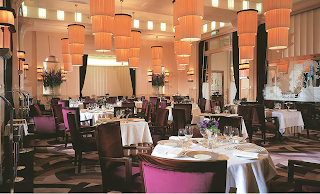 I have never been to Claridges so this post was particularly interesting. We had planned on having tea at the Peninsular Hotel in Hong Kong, but all the Rolls Royces, Ferraris and Porsches parked outside were firstly a bit daunting and when we saw the price list, and worked out what the exchange rate was from S.African Rand where we lived at the time we decided it was way beyond our reach. Never mind we did enjoy looking!! You did a good job for not being comfortable with desserts. 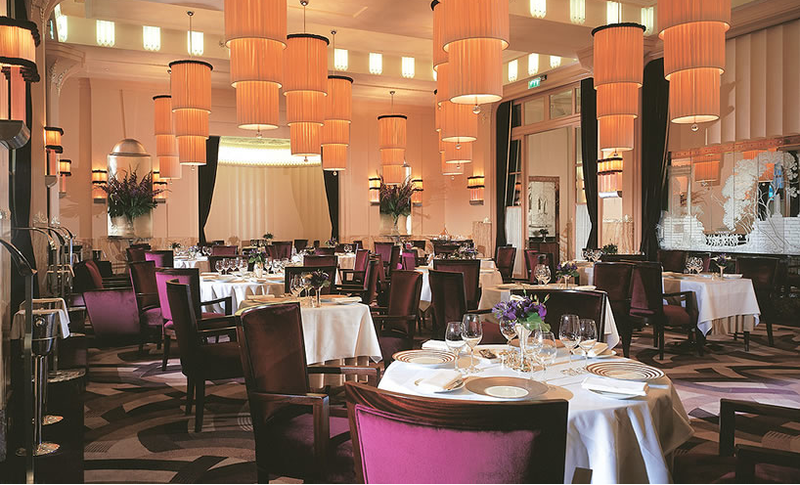 Claridges is splendid, indeed -- and so is your dessert. A lovely post, Deana. 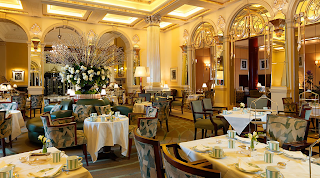 I can imagine tea at Claridges is an experience one would never forget! I loved that you included some of Claridges' history, in particular the story about the Yugoslavian prince was very interesting. The Strawberry Fraisier is gorgeous. Wow. First of all, I'm insanely jealous that you've had tea at Claridges. I loved seeing all the old photos and then how it has transformed to its current state. If I'm ever back in London (and I sure hope to be) I definitely want to try it. Second of all, your Fraisier is fantastic-looking. It's obviously a lot of work and you really did a beautiful job! I would love tea at Claridges. Sometimes I just serve a nice tea for myself, and ignore everyone else. Your dessert is just beautiful! What poetry in dessert form! One day I promise myself I will take a vacation, stay in an apartment in Europe somewhere with a great kitchen and make this among other beautiful recipes you have written up, and conduct several subsequently gorgeous teas and lunches for my favorite people. I recall a great high tea in an old hotel in NYC, but I am sure Claridge's is the true Ur of tea time. As you may recall, I was in England in May and June this year and had the opportunity for tea in London and in the south downs on numerous occasions. Your post brought those wonderful memories flooding back. Scones with clotted cream, savory eggsalad sandwiches on trimmed bread... wonderful. We enjoyed tea at the Savoy (where we were staying) as well as at Fortnum and Mason, that British institution. Next time we'll try Claridges. Our nephew is in school now at the LSE, so we'll visit frequently! I LOVE your introduction and description of your TEEN AGE experience with a tea party! I think we all (myself included, even though I am of Mexican heritage) have had a flirtatious moment with a grand tea event. I would put cold water into my little china cups and serve my teddy bears and put on the act of what I THOUGHT was proper English behavior. But what a lucky YOU for having the skills to acquire the history and the materials necessary to compose a true-to-life replica of an almost theatrical presentation. We love tea and have our tea-time nightly. This summer during the hottest evenings, I just opted to make ICED TEA which of course alters the experience, but goes down SMOOTHLY all the same! 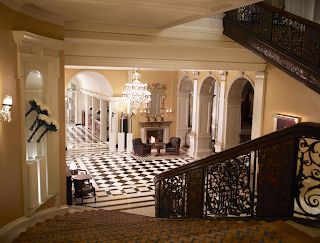 What a wonderful introduction to Claridges and how lucky of you to have experienced it. I loved your history noes because they match a book I am reading on the history of London. Your fraisier looks sublime, both versions. Good idea to try the sponge cake. 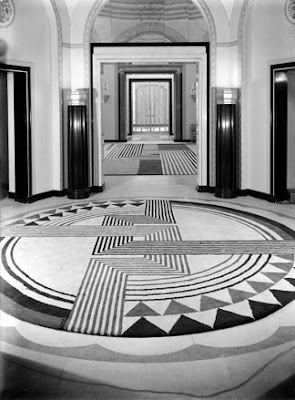 Love art deco (which kind of evolved from art nouveau)but then I went to boarding school at the Cranbrook Institutions in Michigan and we were immersed in it what with Eliel Saarinen. As for your strawberry Fraisier, I saw it online while we were away and thought it looked divine. Such a beautiful presentation! Another beautiful and delicious creation! And another reminder of a kinder and gentler world. Been to high tea at the Ritz down this way, but I hear that tea at Lady Mendl's in NYC is exquisite! Wow. Just wow. As always you have produced a work of art. I would not have had the patience!! And I 100% agree - the 1930s interior is far superior. The dessert your created is absolutely gorgeous. I'm sure it's a bit tricky to unmold such a delicate thing. The one in the dish is every bit as beautiful. so pretty! great job. thanks for sharing!